After seven hours of delegations, not one member of the DP Board or its Advisory Panel engaged in discussion or posed any further questions of staff for clarification. The Board moved immediately into a vote. First, the nine members of the Advisory Panel gave their advice. The only member of the Advisory Panel not personally associated with the development industry, Duncan Wlodarczak of SFU’s Sustainability Centre, spoke for deferring the decision until “rate of change” mechanisms are in place to address the balance between market and non-market development in the DTES, as outlined in the DTES Housing Plan. One other Advisory Panel member, Jasminka Miletic-Prelovac, spoke in favor of deferral until the Downtown Eastside Local Area Plan (LAP) is in place next year. But these advisers were ignored. As mentioned, only one of nine Advisory Panel members was not personally associated with the development industry. Although two seats are specifically reserved for developers and two more for architects/designers, Vision Vancouver has also given three of the four seats reserved for the “general public” to people in the development industry: Kevin Chen (realtor), Kate Busby (architect), and Jasminka Miletic-Prelovac (architect). Note that the Vision-appointed Chair of the Heritage Commission, Kim Maust, who also has a seat on the DPB, is VP of Bastion Development (which gave $21,000 to Vision Vancouver in 2011 alone; Kim Maust also personally contributed $525). Most of the Advisory Panel spoke in favor of Sequel 138, expressing sympathy for the developer — their colleague. Ironically, the advice of the Advisory Panel had no weight. The Mayor’s Office had already decided that the project was going to be approved, and had directed the Deputy General Manager David McLellan to ram the approval through. There are only three voting seats on the DPB, all of which are filled by senior city staff. David McLellan spoke first. He admitted that the project might cause gentrification, that half of the token “social housing” units are not at all affordable, and that the day’s meeting had been run in a problematic way. He did not address any of the community’s concerns or Advisory Panel’s concerns. He simply read from a list of pre-written talking points, then voted in favor of Sequel 138. McLellan’s subordinate Kent Munro then voted in favour. The third and final voting member, Peter Judd (General Manager, Engineering), suggested that the social housing units could be made less expensive than $900/month. This was shot down by McLellan, and Judd’s vote quickly fell in line. The audience jeered. DPB meetings are supposed to be open to the general public, and have historically been held in council chambers. Over fifty people had signed up to speak on April 23, and the city was well aware that a large contingent of residents from the Downtown Eastside (DTES) was planning to attend. 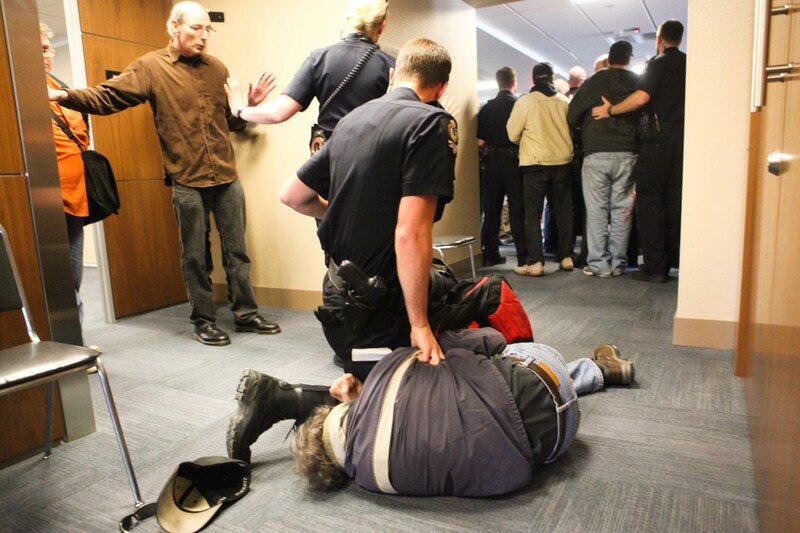 The Mayor’s Office decided to block DTES community members from physically attending the meeting. The city booked the meeting in a room too small to accommodate the delegates, then drew up two sets of rules. One set of rules applied to the developer and his agents, who were allowed to sit physically inside the DPB meeting room. 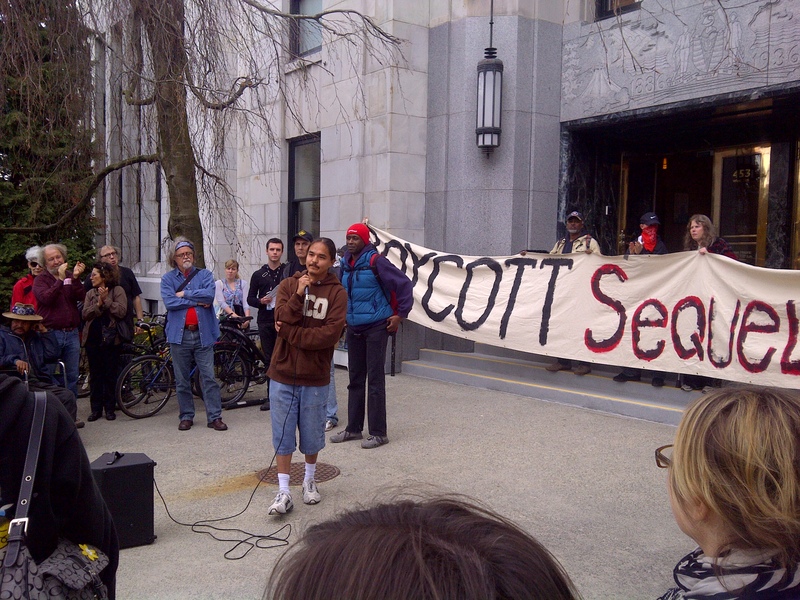 The other set of rules applied to members of the larger DTES contingent: they had to sit in a different room outside and watch the proceedings on a screen. If someone had signed up to speak, they were only allowed to enter the DPB meeting room when called, escorted by police, and then were forced to leave the room after speaking. The city called the VPD to enforce these two sets of discriminatory rules, unprecedented for DPB hearings. 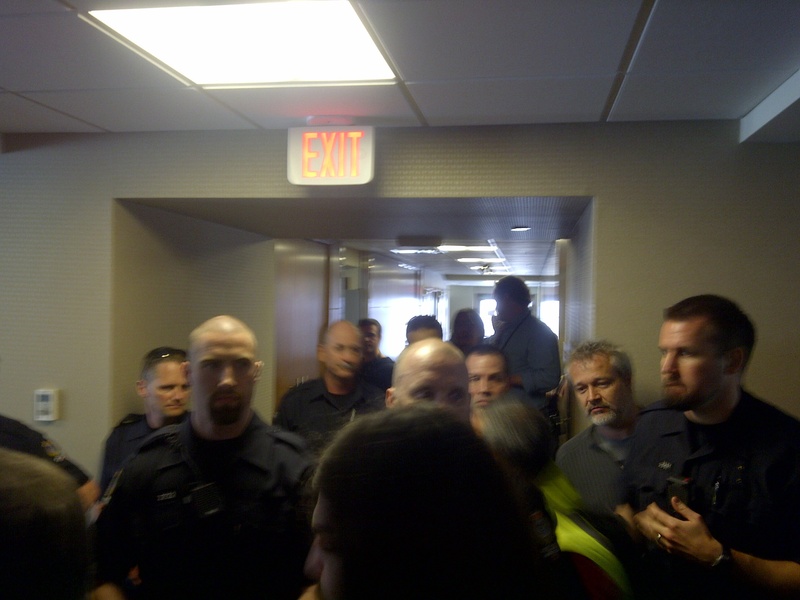 After holding a rally outside city hall, which included a singing choir, food, and speeches, the large DTES contingent made its way toward the DPB meeting room, only to find the door blocked by 21 VPD officers, in addition to City Hall security. Two community members who had signed up to speak waited at the door of the meeting and, when prevented from entering, insisted (verbally) that the meeting should be moved upstairs to council chambers, which were empty, so as to accommodate the public. For no other reason than the fact that they voiced their opinions, these two registered speakers were assaulted by the police. The first was forcibly dragged down the hall and thrown into the wall. See picture. 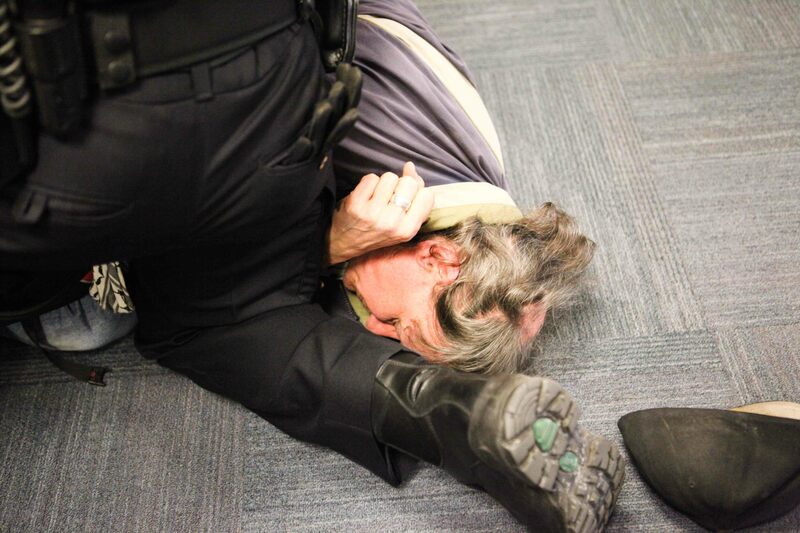 A second older man was thrown to the ground and pinned to the ground for no purpose. See picture. At that point a scuffle ensued and a third man was assaulted by police and strangled, again for no obvious purpose. The officer responsible, who had lost his head, was quickly removed from the room by other officers. All of this was completely avoidable, and was purely a product of the violent and discriminatory approach taken by the Mayor’s Office and head of City Hall Security, Gary Wilson. 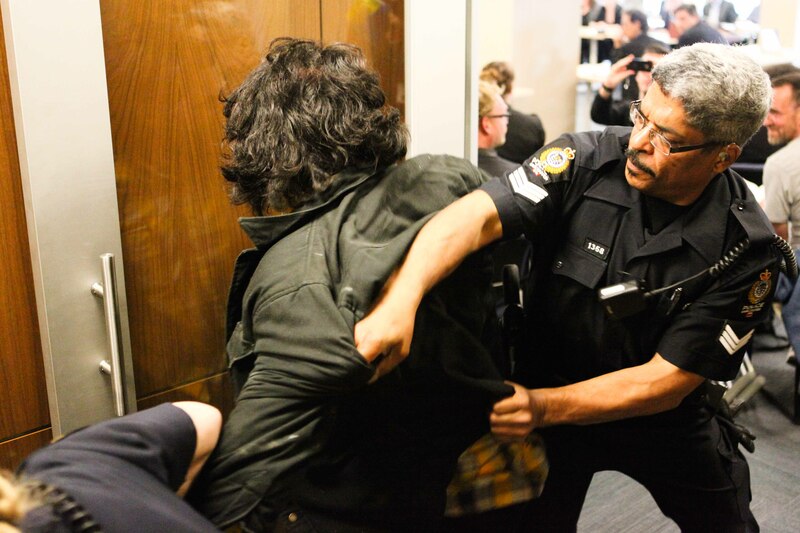 While the VPD were assaulting and discriminating against DTES community members, Vision Vancouver Councilors, including Geoff Meggs, Kary Jang, Andrea Reimer, and Heather Deal, kept their distance upstairs on the third floor. 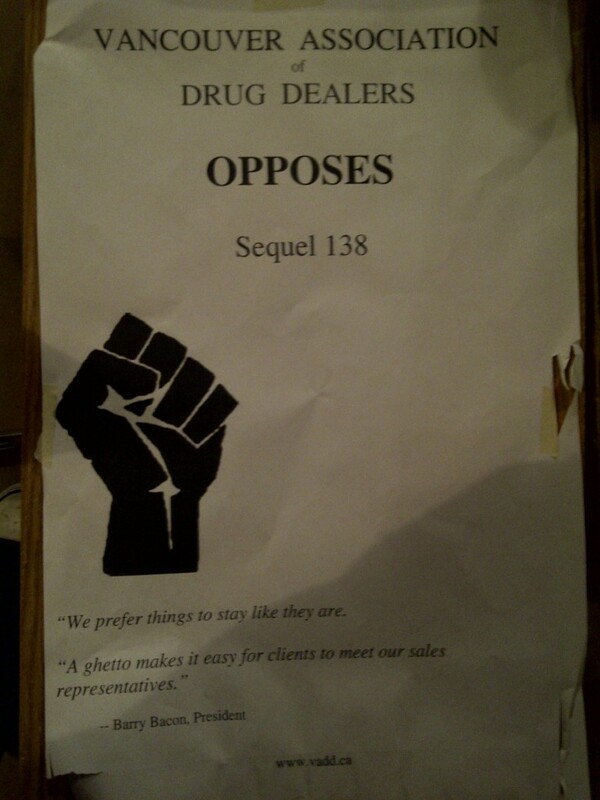 In the lead-up to the April 23rd DPB meeting, there was a coordinated campaign by the Sequel 138 developer team to demonize opponents as “drug-dealers.” Sequel 138’s marketing manager, Anthony Kuschak of Sutton Group West Coast Realty, used the @Sequel138 twitter feed to continuously attack VANDU, a grassroots peer-support group. 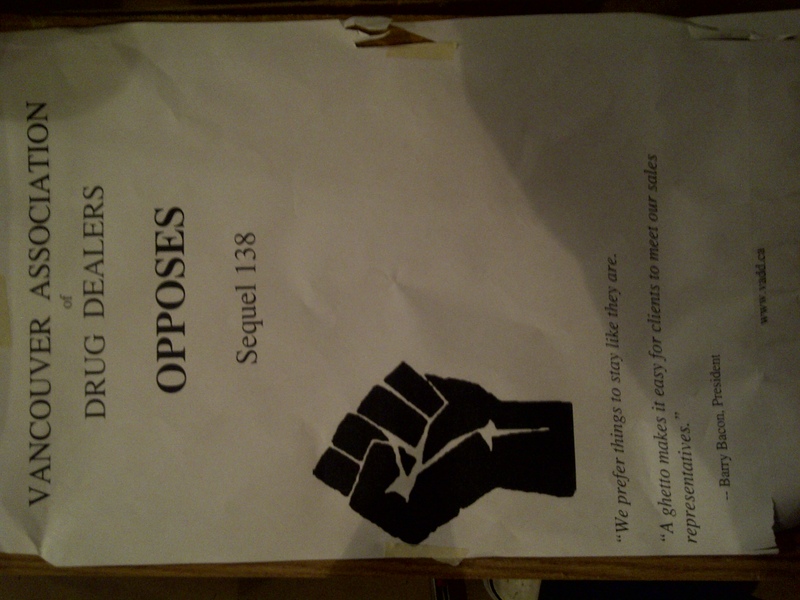 Kuschak also personally wheat-pasted the DTES neighbourhood with posters aimed at associating VANDU with “drug-dealers.” The poster, below, was also racist in more ways than one. VANDU is an award-winning organization that mentors harm-reduction groups around the world, and without whom Insite would have been impossible. For a “professional” developer to target a community organization in this way should set-off alarm bells. In Vancouver, Worthington Properties has redeveloped the landmark Koret building at Columbia and Gore and is currently restoring the Pantages Theatre on Hastings as part of a larger development. “It’s what I like to do: Buy distressed sales properties that were primarily court sales and tax sales, properties in difficulty, and then turn them around into successful ventures. That’s our model” [said Dan White]. Further, Dan White, who described himself as the “point man” behind mill owner Worthington Mackenzie, has a background that includes convictions for money laundering and illegal liquor sales. He was associated with a network connected to some of B.C.’s most notorious underworld figures, including Martin Chambers and the Hells Angels. It is also concerning that Vision Vancouver, which claims to support Insite, has been working so closely with the developer of the Sequel 138 project, and has not said a word about its divisive tactics and demonization of drug users. The province concluded that: “The best thing that could happen to the Downtown Eastside is already happening – it’s being cleaned up. As some of the most expensive real estate in Canada, it’s inevitable. Council needs to ignore all voices, no matter how strident or angry, that defend the DTES’s abominable status quo.” Indeed, Council followed the Province‘s suggestion “to ignore all voices” in the community. Despite these barriers, the people of the Downtown Eastside took the high road and delivered 50 of the most moving and powerful speeches delivered in this city (prompting one Advisory Panel member to suggest, although in the usual patronizing tone, that prizes might have been allotted to many speakers). The most common topic through the seven-hours of speeches was that the Downtown Eastside is a unique, positive, non-judgmental community where people care about each other and look out for each other. For that reason above all others, many said they are committed to opposing gentrification of the neighbourhood by Worthington Properties, Vision Vancouver, and their corporate developer funders. Today, Friday April 27 2pm in the Carnegie Gym, a “non-violent civil disobedience training” session is being held to launch a campaign against developer profiteering in Vancouver’s poorest and most courageous neighbourhood. Posted in City Hall, Downtown Eastside, Gentrification, Housing, Police, Public Expression. Bookmark the permalink.